Employee engagement is a personal matter for each individual. To significantly increase employee engagement you need to understand the passions, motivations, and expectations of the individual. Our Individual Employee Engagement Assessment maps the individual employee's passions, motivations, expectations and the degree to which their expectations are perceived to be already being fulfilled. Employee engagement is highly unlikely unless we ensure that the person's role in the organization is in alignment with their passions, goals, interests, and work preferences. Our SmartQuestionnaire measures 175 factors to identify a wide range of these factors and our Job Success Analysis Report compares those factors to the tasks, responsibilities, and performance requirements of their specific job. Once we have established a reasonably good job fit, the next step is to understand the individual employee's goals and expectations. 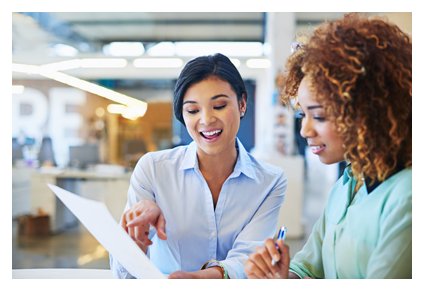 Our Individual Employee Engagement Assessment identifies and ranks important employee expectations and the degree to which the employee believes they are being fulfilled. The critical employee engagement factors are the expectations which the individual employee believes are important but that are unfulfilled. If this gap is large, there is a serious risk of disengagement and/or employee turnover. Since individual employee engagement comes from within, it is also important to understand the employee's behaviours in relation to their strong expectations. In some cases, their behaviours may support their expectations, but in other cases, their behaviours will actually hinder the fulfilment of their expectations. 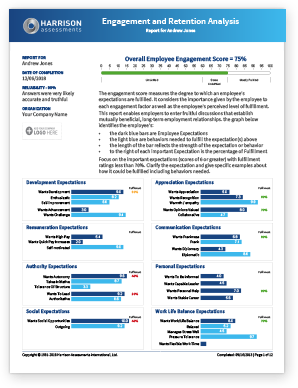 Our Individual Employee Engagement Assessment provides this data, which opens the opportunity for a highly effective engagement discussion and shared responsibility for engagement. Track employee engagement levels over time to determine improvement for individual employees, teams, or the entire organization. The Harrison Employee Engagement Pulse Check can be completed in less than 5 minutes and provides an excellent means to achieve continuous improvement as well as maximize management's engagement ability. Train your managers to engage and retain their people using our brief Employee Engagement & Retention course. Employees who have already completed our SmartQuestionnaire for other talent functions do not need to complete another questionnaire to access the Employee Engagement and Retention report. It's all based on our 25-minute SmartQuestionnaire.